Dentoaleveolar discrepancty, i.e., due to crowding. Dicrepancy between maxilla and mandible, i.e., camouflage treatments. To minimize the extractions carried out to correct crowding, the treatments with expansion, distalization, protrusion (anteroposterior or sagittal expansion) and stripping can be carried out. Colaboradores: Dr. William Clark, Dra. Emma Vila Manchó. Because of the great success of the first edition and great interest in it, the 2nd edition is published. Dr. William Clark, who has described the Transforce appliance. Dr. Emma Vila Manchó,who has described the pathology associated to the use of removable appliances, revision protocols for patients to prevent lesions, and for patients in risk. Professor Dr. José Durán von Arx,who explains the study of functions and functional reeducation through stimuli. Dr. Jordi Corominas,who explains the importance of amigdalae, the mouth breathing, and the soring child: diagnosis and treatment. Creemos que la aparición de los microimplantes es uno de los acontecimientos más importantes de la historia moderna de la ortodoncia. Los microimplantes han conseguido poner el anclaje absoluto al alcance de todos los ortodoncistas por la sencillez del método y por la relación coste-beneficio tan satisfactoria. When 55-60% of patients treated by orthodontists are adults, and the demand for esthetics is each time more important, the need for inivisible orthodontics has been created. In 18 chapters, this book explains in detail, apart from the appliances used by author the phylosophy which insipires the approach to patients in mixed dentition. Furthermore, the book clearly specifies the activation and clinical follow-up of these patients. According to Dr. Echarri’s phylosophy, the early treatment in a patient is very important in prevention, interception and correction of malocclusions. In this book, he explains his way of treatment of different malocclusions in children. Dr. Echarri is a busy speaker and lecturer of the courses around the world, especially in Lingual Orthodontics. In his 3rd book, he exposes his clinical and teaching experience in this specialty. This book has had great success and it has been translated to English and Korean language. Dr. Echarri has always considered the team work very important, which is why he dedicated his 2nd book to dental assistants and hygienists. This book was written with Dr. Antonio Lucea on auxilliary staff training. 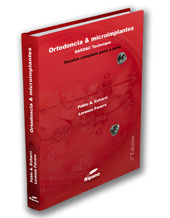 This is the first book written by Dr. Echarri, in which he integrally reflects his interdisciplinary phylosophy of orthodontic treatment, and the essential importance he gives to the diagnosis of a patient. This book has been great success, and it has has its 2nd edition.